The stream of tears to mourn the departed has hardly dried when a new chapter is opened. Life, after all, must go on; this is more so for the women. Men, it appears, mourn their late wives. But women, for apparent reasons, replace their departed husbands. The resulting scenario is a gender gap in late life remarriage, where windows are more likely than widowers to remarry. Halima Maude Fernandez, the widow of late billionaire Anthonio Dehinde Fernandez, has remarried 3 years after her husband's death. The baroness of Dudley, who was married to Ambassador Plenipotentiary, Anthonio Dehinde Fernandez, from 2003 till his death in 2015, married her younger Rwandan lover, named Zubair Rudasingwa on Wednesday, July 11, 2018, in Kano. However, Its often said, a maiden marries to please her parents, a widow to please herself. Halima Maude Fernandez, the widow of the Ambassador Plenipotentiary, Oluwo Oladehinde Anthonio Fernandez, has pleased herself a great deal. She contradicts the African widow stereotype in more ways than could be imagined. She is not a symbol of neglect nor is she caught in a perpetual vortex of misery and lack. 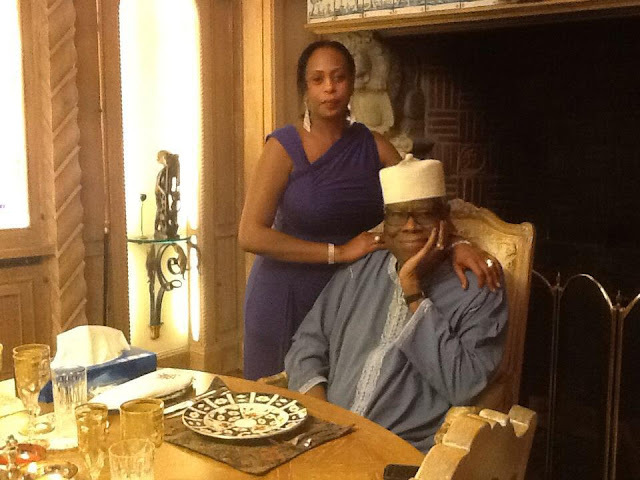 When her husband, who she married in 2003, died on the 1st of September 2015, in a private hospital in Brussels, Belgium at age 86, many knew his demise would leave Halima desolate for a very long time. And the reason was hardly far-fetched; such thought was predicated on the widely known fact that Halima’s love for her husband was inestimable, defying reason and every cliché on affection even till date. So strong was the bond between them that Halima was grief-stricken for so long that she seemed totally lost in a trance. Today, the music has changed! She eventually found someone that would give her solace from the abyss that the death of her husband plunged her into. Halima has found someone else and moved on with her life. Whatever the case with the dead and apparently forgotten man whose wife has moved on, his friends and family would never forget how his widow, Halima, looked distraught in the wake of his death. So devastated was Halima that hardly anyone imagined that she would get over her beloved husband, Fernandez, so soon and thereafter remarry a younger lover three years after. The marriage ceremony which was well attended by Halima’s family and friends last Wednesday in Kano State, generated a buzz in high society as everyone marvelled at her rapid evolution from a distressed widow to a beautiful bride. Before then, Halima cut a perfect picture of a moping mum, a widowed wife and heartbroken lover. Her soul was sad and her glance was glum. She sought no adventure and became impervious to the promise and fresh vistas of love and companionship. To her, this seemed a worthy price to pay for losing her husband and having her love cut in his prime and yanked from her life just when she needed him most. Until she met Zubair Rudasingwa, a Rwandan. Yes, as you read, no longer for Halima is the lonely nights and lonelier days. Today, you have a colourful picture of Halima laughing heartily and swaying to the melody of her newfound love, in the arms of another man with whom she currently shares a pulse. Indeed, no one wishes to be buried with the corpse of a loved one, no matter how deeply they were in love with each other. In the end, after the crying and mourning is over, everybody moves on; like Halima has moved on. And these are indeed precious times for Halima. She smiled contentedly through the proceedings. Anyone would feel such contentment in such a defining moment. She cut a marvellous picture as she sashayed towards her groom. She bit her lip nervously and sweated profusely in the thermo-induced chill of the grand setting, the gaze of onlookers and culmination of months of expectation. It took keen observers to deduce that her anxiety was borne of bliss and love everlasting after lost her husband about three years ago. That blend of anxiety and ritual splendour in a relaxed atmosphere was something very special. For Zubair and Halima, being granted the bliss of having their wedding day dawn amidst so much spectacle and grandeur was a dream come true, the effect on the newlywed couple was intense. The beautiful bride and groom walked down the aisle single and glided back up happily married. Halima looked calm, even joyful; perhaps she was quivering beneath all the lace and flowers, we may never know but together with her groom, they presented a stronger portrait than they do apart. The couple managed to exhibit a common touch without sacrificing the mystique of love eternally. Take Halima for instance, on the d-day; the sunshine of her shy smile outshone even the most demure royalty. The way she carried herself indicated among other things that she was finally, living a fairy tale in which she had always imagined herself to be a princess and her soul mate, a prince, with whom she had truly evolved to be a queen. The romance between them was initiated months back when a mutual female friend of theirs introduced one to the other. According to an insider source, natural rapport characterised their meetings afterwards. Weeks later, their friendship took a new direction and the rest, as they always say, is old hat. As they embarked, on one of the most blissful matrimonial sojourn yet, friends, families and associates wished them the best of everything true love could found; a lifetime untainted by the infidelities and disappointments that befalls even the most idyllic of matrimonies. However, in the wake of her husband’s demise the subsequent tiff she had with her stepdaughters, Abimbola and Antoinette, is well documented in the media. Like the dirty sink, the ongoing feud within the Fernandez family symbolises the cut-throat world of filial relations; Abimbola, one of the children of late Ambassador Dehinde Fernandez and the billionaire’s widow, Halima, were at loggerheads. Both stepmother and stepdaughter engaged in a bitter feud that played out hideously on the social media. It was really a messy scandal as the family feud deepened between Halima and Abimbola with both parties taking shots at each other. Halima apparently started the social media war by claiming the billionaire is not Abimbola’s father, she also allegedly called Abimbola’s mother a whore and Abimbola fired back calling Halima, her father’s mistress and not his legitimate wife. Forget the nonstop ricocheting gunshots that have shattered the innocence of the North, the mindless, daily killing of hapless citizens by the despicable Boko Haram group, one of Nigeria’s most enduring billionaires, late Ambassador Dehinde Fernandez preferred the city of Kano to anywhere else in Nigeria. Of course, if you have a beautiful Kano-born beauty like Halima, his wife, a lifelong companion, you would wilfully tag along with her to the glaciers if that were her preference. But Kano is Halima’s home and the Ambassador plenipotentiary made a home in the northern state during his lifetime for the sake of love. We gathered that the Baron of Dudley – one of his many global titles – had an impervious fortress for a home in the heart of the city complete with a helipad and flies directly from there to his chateau in Paris, France. Hitherto based in Abuja before her marriage to the moneyman, Halima was one of the highflying ladies popular in the corridors of power and among powerbrokers as the Ford Taurus is popular among Americans. 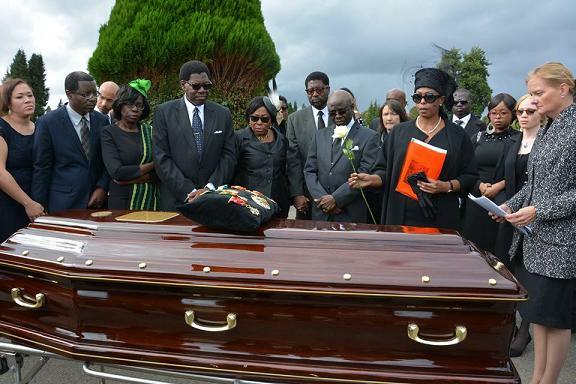 Chief Deinde Fernandez was denied the luxury of choice, in death. Sadly, the world-renowned billionaire and Yoruba traditionalist, who celebrated his history and culture without reserve, didn’t bury in the land of his forebears. Halima decided to bury him in faraway Belgium. Some mischief-makers earlier reported that the confusion faced by the deceased’s family over where to bury him is attributable to his inability to own an abode in Lagos while he was alive. The old Fernandez tower was sold years ago and Fernandez had only one mansion in Kano State where he lived with his trophy wife, Halima. Further findings revealed that the decision to bury him in Belgium was championed by his wife, Halima, following several long-distance conferencing via Skype among other channels of communication. Chief Antonio Oladeinde Fernandez was a Nigerian business magnate, diplomat and Permanent Representative of the Central African Republic to the United Nations. He was considered one of the richest men in Africa. In addition to a variety of other chieftaincy titles, he held the title of the Apesin Ola of the Egba clan of Yorubaland.